I watched "Children of Men" last night. As emotionally exhausting as the movie is, it is amazing. The camera work was very up close and personal and helped really get you close to the characters and find empathy, joy and misery with them. The story completely sucked me in and the actors did such a great job that I connected with them on a deeper level. As heavy as the movie was, I have to completely appreciate the fact that it was based on a well-written story, was wonderfully shot and directed and the acting was fantastic. I must say, though, that I may never want to see this movie again, simply because it was so emotionally taxing. I've been listening to the new Editors record online today. In my opinion, it's not that good. The single "Smoking Outside.." is a great song with a strong melody and hook, but the rest of the record is just weak. Not to mention that you can't help but feel like you're listening to a bad Interpol ripoff when you hear it. In journalism, I am in utter awe of US Weekly magazine for taking a stance to not publish any more stories surrounding Paris Hilton. I think for a semi-gossip publication they have just gained a little integrity with this decision. Now if they can just stay away from Crazy Spears and that Lohan chick, they might step into the realm of true journalistic legitimacy. Oh, and England has a new Prime Minister. Apparently he's very stern. Let's hope that's a good thing. In former Prime Minister, Tony Blair's farewell speech he said some pretty powerful things about his stance on US support and the involvement of the British Armed Forces in Iraq and Afghanistan. He is a great man, he is. I must admit that I may be behind on the whole "White Stripes" thing, but I honestly did not like a lot (if any) of their music prior to "Get Behind Me, Satan." 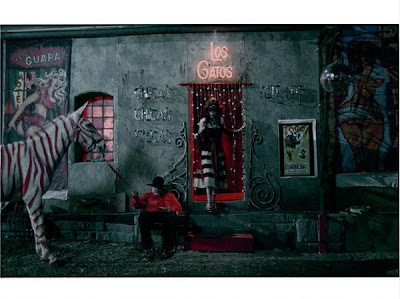 With their newest record, "Icky Thump," the Stripes definitely do it right. This is a great rock record. A little quirky and a little weird at times, but definitely different and certainly good. I'm just glad that they still do have some focus and they weren't just a quick fad like some of their earlier peers The Hives et al. Also, I think Meg White may have learned to play the drums. Her drumming on the record is solid, but I've taken the time to get some great You Tube videos of them playing live (I personally like their recent Conan performance) and they make it happen and they make it awesome. In a sad and very disappointing story, Chris Benoit of WCW, WWF and WWE fame was found dead with his wife and son in their Atlanta home last night. They latest reports are alleging a murder-suicide. Benoit was certainly a wrestling legend in his own right and it's nothing short of devastating to see a story like this. That's right! As you see in the amazing image above that is Sting. One of the all-time greatest wrestlers. I was able to catch Sting live on Sunday night at the TNA (Total Non-Stop Action) Wrestling main event, "Slammiversary." Not only did I see sting, but I also saw Rick Steiner (The Dog-Foot Gremlin) and Animal of Legion of Doom/Road Warriors fame. Needless to say, going to the event was a sight to behold. And Vanilla Ice was in attendance. I was able to watch the first half of a great Japanese film, "Linda, Linda, Linda." While the movie was a bit slow and linguistically hard to follow, James Iha of The Smashing Pumpkins composed the score for the film and the music was amazing. I have not been able to find the songs anywhere online or iTunes, but I can be certain that when I do find them that I will purchase them immediately. Recently, I've been really enjoying listening to good movie scores. It's just one of those times. 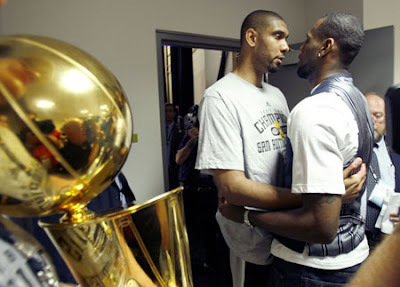 Aside from the fact that I just wanted to post this simply because it makes LeBron James and Tim Duncan look like boyfriends, I decided I would chime in on some sports. Particularly the NBA finals. The only NBA game I've watched all season was last night's final game in which the Spurs manhandled the Cavs in a 4-game sweep. The pure fact that the Cavs could not even contend with the Spurs makes me concerned for the state of professional basketball today. Now, I will remind you that I have not watched one single game this year until last night, but I have kept my head in "the know" through the wonderful espn.com and Sportscenter. My concern is only (in my mind) justified by the fact that the Cavs made it all the way to the NBA finals by defeating some of the (seemingly) best teams in the league, yet could not even come close to winning one game in the finals. It makes me questions the rest of the league...the Cavs other competition. Maybe it just means that the Spurs are just "that good." Maybe I have just lost my love of the game since there are only a handful of pure players in the league. But I really have to assume that, due to the Cavs terrible game play in the finals, that every other team they've defeated along the way must be simply awful. I'll stick with watching baseball. A big moment of musical shame has come upon us all. 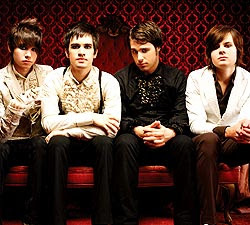 Pretty boy rockers, Panic! at the Disco, have been selected to cover The Smashing Pumpkin's hit single "Tonight, Tonight." Not only do they not deserve the right to even think about covering such a song by such a band, but their rendition of the song is sightly more than disgraceful. It can be heard on the band's Myspace page. I simply wanted to writhe in shame after hearing it. It's a sad, sad shame. I typically prefer purchasing a CD from a record store to having a burned copy or the iTunes version of a particular record. There are certain things like unwrapping the shrink-wrapped jewel case or digi-pack, breaking out the liner notes and seeing art that (usually) fits perfectly with the music and having a beautiful CD to have in my case along with all of my other pretty discs. Every once in a while a record comes along that has packaging, art and design that is truly second to none. 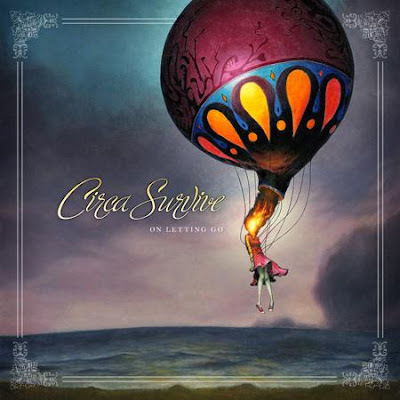 Last night I purchased the new Circa Survive record "On Letting Go" with the anticipation of having an artistically pleasing CD cover and 12 tracks of great guitar work accompanied by only temporarily tolerable vocals. When I got to the point of opening the record I was floored with awe in how impressive, fantastic, wonderful the artwork and design of this record is. Just to let you know, I am huge fan of a stock sleeve in conjunction with the jewel case. Many people just toss these, because they are a hassle and prevent you from getting to the music sooner. Some agree that it's not nearly as cost-effective to have that element added to the overall product as it is being developed. Other, still, just pay no attention to it. I, on the other hand, appreciate this to no end. The addition of this sleeve only adds to the "personal value" of the record, meaning that I would never want to let this record go and I want every piece of it to stay just the way it is. Aside from a beautifully designed sleeve and graphically pleasing art, I was in utter shock when I opened the jewel case to find the 15 or so pages of the liner booklet. I could carry on for days about how the concentric circles cut out of the pages make for an interesting flip through. Ok, that's enough about that. I just wanted to convey the personal importance of a great design for a record. Just a suggestion to check out Au Revoir Simone. Easy to digest and you can't beat three girls from Brooklyn all playing keyboards and singing.